Sight. It's been WAY too long. 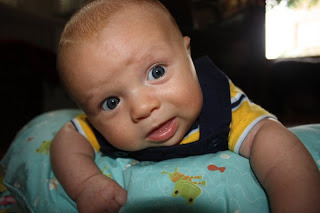 New baby boy has made life quite hectic, but be forewarned! I will soon be back ... am in the process of developing a new blog and fun little project. And I'll kick off the launch next week with a fun little contest and some fabulous prizes. In the meantime, for anyone still out there in wonderland ... meet Huck! Ahh look at those big eyes!! You must have your hands full! Congrats! Thanks, dear! Hands full but LOVING it. Feel free to e-mail me at emilycheramie@gmail.com. Would love to hear more about your upcoming celebration and see how I might be able to help!